The Christmas Park has been a holiday attraction in the upstate since 1958. It is a joint effort by local citizens to convey the Christmas spirit through a unique collection of holiday displays. Each year, local businesses, churches, civic groups, The Town of Williamston, and the Springwater Committee contribute by building original exhibits and placing 1000s of lights in Mineral Spring Park. By night with the sparkling lights on the park buildings and trees, visitors come from all over the upstate and surrounding states to circle slowly along the drive or walk the paths viewing animated displays. A visit with Santa in the Boy Scout Hut is a treat for the children, and parents! The Pelzer-Williamston Jaycees are credited with originating the Christmas Park idea. They saw it as a “Christmas parade that stands still.” The idea soon became the local tradition that area residents look forward to during each Christmas season. 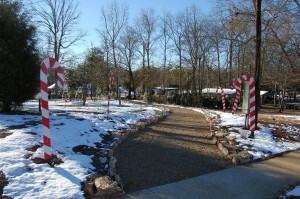 Over the years various groups and individuals have contributed time and energy to erect the Christmas Park. But as enthusiasm declined, fewer people were helping. Finally, after the park went dark one Christmas season, Mertie Kelly vowed not to let it happen again. Through her efforts, the Spring Water Festival was born, providing funds for the Christmas Park. With funds provided by the Spring Water Festival and The Town of Williamston, and many hours of work by local volunteers, the tradition of lighting the park for the Christmas season continues. 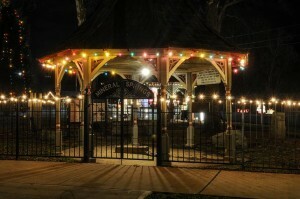 The Christmas Park is open during the month of December, and the public is invited to visit with no admission charged.